I have been lucky enough to visit many amazing luxury villas around the planet so I consider myself a pretty good connoisseur of beautiful retreats. Each gives its own feeling of perfection with glorious scenery, graceful buildings, distinctive furnishings, excellent cuisine, and of course the mandatory house cocktail. Infinity pools nearby make you feel as if you have found the blessed end of the universe, and it all belongs to you. Villa staff work hard to provide one perfect day after another for the guests who visit. Each day ends with sunset drifting into a darkness that promises another glorious day. Luxury rental villas and the staff of them offer beautiful living in one of the most rarified form. 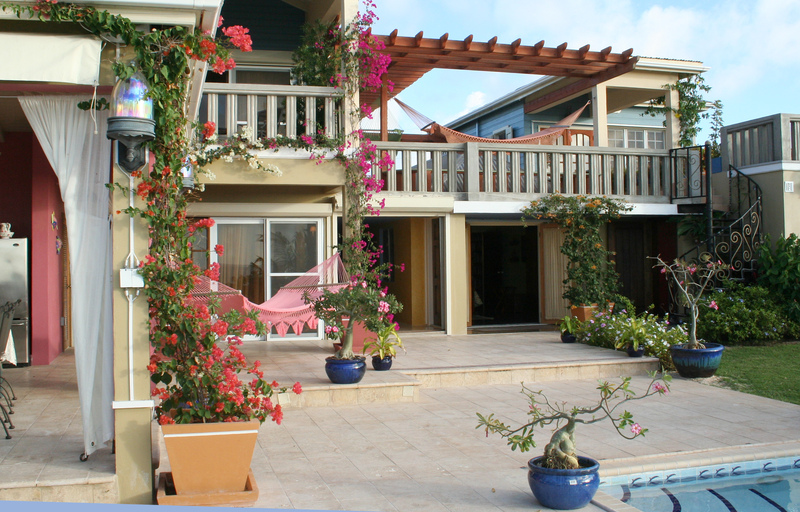 (areal3small) What Anguilla as an island and the Villa at View Fort adds to that experience is a sense of home. It is not a blistering white austere temple to the ocean gods, but rather a brightly colored beautifully decorated home, complete with excellent cooking smells from the kitchen and of course the mandatory Villa at View Fort Rum Punch. With many balconies, hammocks and terraces all planned to show off the beauty of the ocean, the sky, and lush flower gardens for the first few days we only left to visit the famous beaches of Anguilla, to get warm and salty, and then drifted back to the comforts of home. Here you feel that your life is filled with loving friends who appear just when you are thinking you need them and no matter when you come back will have been looking forward to your return. The Villa at View Fort has two upstairs bedrooms with a large balcony accessed by wide doors where the only distinction between inside and outside is floor to ceiling diaphanous white curtains. Each bed is heavy dark hand carved wood with a luscious mattress that makes sleep a gentle reward waiting like a gift at the end of each day. Soothing tiled bathrooms with rain head showers, large Jacuzzi tubs, fabulous stone sinks and as many different candles, water fountains and soft lighting effects as possible so that you can create any mood that soothes you. The two bedrooms on the ground floor offer a sense of the old world island architecture within softly painted Caribbean colored walls and gaily designed pillows and throws. The 200 year old bedroom known as “The Cottage” with its lime green walls and handsome bed facing the sea is the essence of welcoming island rest. A small rectangular swimming pool set into the center of the main terrace is not only the perfect temperature but has an adjunct area where you can sit on a tile bench in the water, put your feet up on an edge with nothing before you but the million blues of the Caribbean sea. I found this one of my favorite perching spots during the day, cooled by the water and warmed by the sun with the ever present View Fort rum punch nearby.